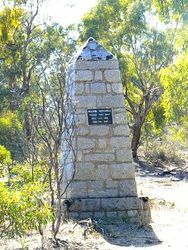 The cairn commemorates the Major Mitchell expedition which passed through the area in 1836. In July 1836, Major Thomas Mitchell with six of his men passed through the western part of what is now the City of Stawell, when he deviated from the line of his journey to the coast in order to ascend the highest peak in a noble range of mountains. He named them after the Scottish Grampians, and the highest peak, on which he spent an uncomfortable night, in sub-zero temperatures, Mount William in honour of the English King. His glowing report of the fertile plains of Western Victoria was responsible for the occupation by squatters of Australia Felix seeking new grazing land. At the unveiling of the Bulla memorial for Hume and Hovell, Charles Daley the Secretary of the Victorian Historical Society suggested that the idea be extended to other explorers and a committee was formed to mark out the routes of Charles Sturt, Thomas Mitchell, Angus McMillan, and Count Paul de Strzelecki. 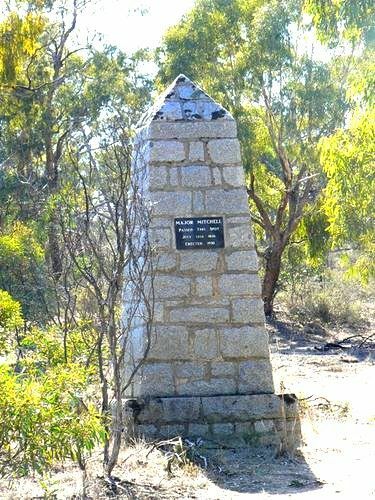 Thirty-six cairns or tablets to Mitchell were erected at Nyah West, Swan Hill, Cohuna, Mount Pyramid, Fernihurst, Wedderburn, Kanya, Stawell, Mount William, Horsham, Mount Arapiles, Miga Lake, Harrow, Coleraine, Casterton, Dartmoor, Isle of Bags, Portland, Mount Rouse, Mount Napier, Hamilton, Lake Repose, Dunkeld, Middle Creek, Mount Greenock, Skipton, Mitchellstown, Nagambie, Castlemaine, Expedition Pass, Kyneton, Benalla, Wangaratta, Chiltern, Gooramadda and a public park at Natimuk (Major Mitchell Park, Mount Arapiles, Natimuk). On Friday next the Governor (Lord Somers) will, at the invitation of the Historical Memorials Committee, unveil a memorial erected at Stawell in memory of Major Mitchell, the Australian ex Members of the committee have also arranged to leave Melbourne on 28th March to unveil memorials at Talbot (2 p.m) and Lexton (4 p.m.) and at Middle Creek on 29th March at 10 a.m. Other memorials to Major Mitchell will be unveiled at a later date at Harrow, Penshurst (near Lake Repose), Chiltern, Nagambie and Korong. Age (Melbourne), 7 March 1930.